SIPROTEC and SICAM – Siemens products and solutions for protection engineering, station automation, power quality, and measurement – can be connected directly and easily to MindSphere and other cloud-based platforms. 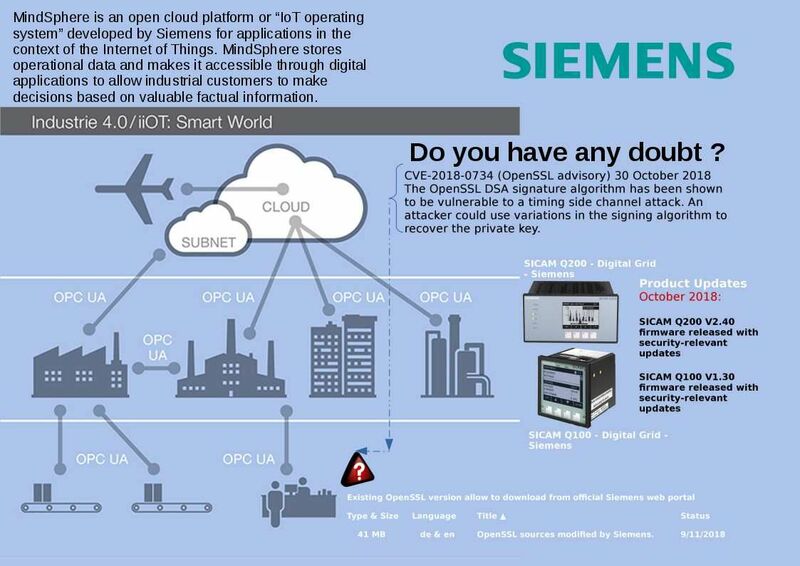 MindSphere is an open cloud platform or “IoT operating system” developed by Siemens for applications in the context of the Internet of Things. MindSphere stores operational data and makes it accessible through digital applications to allow industrial customers to make decisions based on valuable factual information. OpenSSL sources modified by Siemens issued on 11th Sep 2018. However OpenSSL DSA signature algorithm has been shown to be vulnerable to a timing side channel attack (use variations in the signing algorithm recover the private key). Above vulnerability with reference number CVE-2018-0734 announced on 30th Oct 2018. It looks that there is a gap in between version. But it cannot confirm whether there is an impact? Regarding to above technical details. Do you have any doubt?